He remarks that the other required components, such as calcium and iodine, came from the dissolution of sea shells and the release of ions from the death of algae and other organisms added to the solution. He mentions that his recipe was adapted from something called the “Brighton Formula” – apparently the analysis of seawater from off the coast of England made by Edward Schweitzer in 1839. Gosse’s formula was repeated in aquarium books for many years, at least through the turn of the century. However, most aquarists opted to use natural seawater for their marine aquariums for the next 100 years. In 1950, well known aquarist Albert Klee developed a synthetic sea salt formulation for the Cincinnati Zoo’s Fleischman Aquarium. This salt had about 16 constituent salts and was marketed to home aquarists in the area as well (Klee – personal comm.). However, the advent of modern synthetic seawater came about with the development and subsequent popularization of the “Frankfurt Formula”. While its history in European aquariums is not well known to me, in the United States, it was later adopted by public aquariums, and there was a corresponding improvement in the ability for public aquarists to maintain their marine aquariums using synthetic seawater. The first reference I could find of the use of the “Frankfurt Formula” in the United States was April, 1962 in an issue of “Drum and Croaker” an informal public aquarium journal. In this article, Rick Segedi and Bill Kelley discussed their using a “formula received from Dr. Dieter Backhaus of the Exotarium in Frankfurt, Germany.” In 1964, Segedi and Kelley published a revised Cleveland formula that contained 22 compounds. Two obvious changes to the Frankfurt formula included the addition of EDTA as a chelating agent and sodium thiosulfate as a source of sulfate ions, as well as a dechlorinator. It seems that eventually, this Cleveland formula became an early version of Instant Ocean. William Braker, then the director of the John G. Shedd Aquarium in Chicago, also wrote about this in his 1966 book, “Marine Tropicals”. He acknowledges that the formula he used had been modified by the Cleveland Aquarium (in reference to Bill Kelley). He also lists his modified formula which contained eighteen salt compounds. Rila Marine Mix was an early sea salt available in the late 1960s and early 1970s. I recall considering this salt as a “discount” product, somewhat inferior to Instant Ocean, but less expensive. Because it was commonly sold by biological supply companies, it sometimes ended up being a de-facto standard for early biological studies involving marine organisms in captivity. Old time aquarists may also recall a product sold back in the 1960’s by the name of “Magic Marine Mix” and later, a similar product called “Wonder Water”. These products purported to allow you to mix marine and freshwater fish together in the same aquarium. The examples they gave were damselfish and black mollies (the latter, a euryhaline species able to tolerate normal seawater). As I recall, this product was a mixture of a small amount of sea salt and sugar (used to raise the osmotic pressure of the solution for the marine fish without the added toxicity of the salts for the freshwater species). In the heyday of home marine aquariums in the early 1970’s, there was Rila, Instant Ocean and then some premium imported German salt mixes. Using my paper route money, I always bought Instant Ocean because that was best of the salts that I could afford. I recall one brand that was sold in waxed cardboard “milk cartons” – this may have been an early Marineland salt mix. I also attempted to create my own saltwater using the Gosse formula in order to save money and extend the amount of seawater I could prepare – the results were poor to say the least. (Table 1) Approximate ionic composition of elements used to create synthetic seawater. Table 1 gives the basic ionic composition that synthetic seawater manufacturers are targeting. Table 2 lists the broad categories of various synthetic sea salts that are on the market at the present time. (Table 2) Basic varieties of synthetic sea salt mixes. Marketing Hyperbole abounds with sea salt manufacturers; every product is touted as either the best quality or the best value, or both! Anecdotal experiences also cloud the issue: “I used brand A and all my fish died”, or “Here is a picture of my wonderful reef tank, I use brand B” are both invalid observations; the brand of salt used is only one of many contributing factors to a marine aquarist’s success or failure. Indeed, most commercial sea salt mixes can be used to good effect; they are just one tool that an aquarist needs to be successful. Even laboratory testing of a product may not give valid information. Bio-assays can be performed that measure the ability of delicate animals (such as larval invertebrates) to survive in a given seawater product. Some freshly mixed synthetic sea salts contain trace contaminants of ammonia (as high as 0.25 ppm) or may have a very high initial pH. These salts may prove lethal to those delicate creatures when first mixed, but in real world use, an aquarium’s bio-filter would render that level of ammonia non-toxic in a few hours, and the pH would stabilize to normal values after aeration. Chemical testing of sea salt after mixing is also done, but seawater is such a milieu of different elements, that such testing may not accurately reflect how well a particular brand of salt will perform when used in an aquarium. In the early 1980s, Instant Ocean Hatcheries was established in Florida, and this was a marketing coup for Aquarium Systems (Producer of Instant Ocean). The idea that their product could be used to raise clownfish, (which few, if any home aquarists could replicate at the time) implied that their product, in the right hands, was the best available sea salt. Additionally, the photograph of the school of baby clownfish on their packaging was visually very striking. Aquarium Systems also produced the “Instant Ocean Handbook” and “The Seawater Manual” that helped ensure that home aquarists had good basic information about their aquariums – a rarity in the day when one could still buy books about marine aquariums written in the 1960’s. A few salt manufacturers took the low road; knocking the quality of other brands as a way to better market their own. To an extent, imported brands carried some prestige as being “exotic”, and that may have helped to sell more of their product in North America. 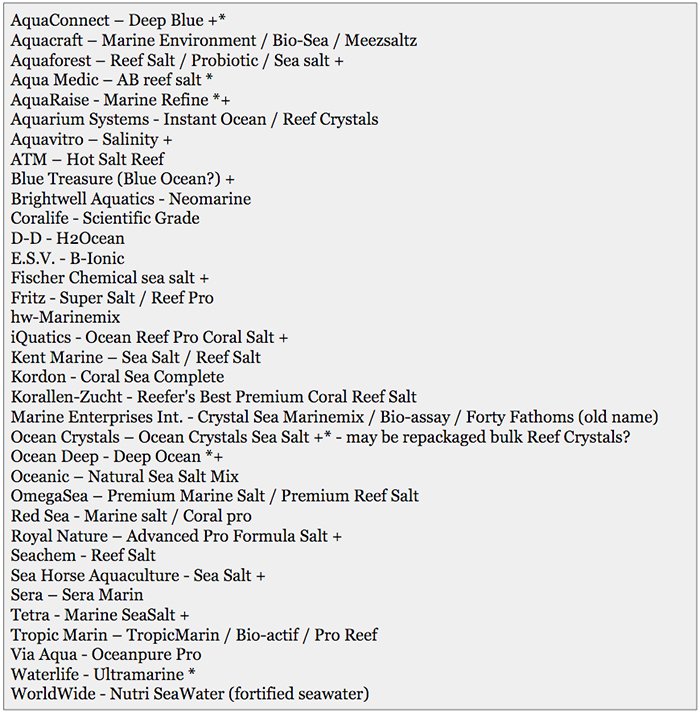 Table 3 is an attempt to list the variety of brands of synthetic sea salt available to aquarists (primarily in North America). Because manufacturers may produce multiple salts under different labels, it is impossible to say how many of these brands are custom-mixed by the manufacturer or how many are just re-labelled products sold by a distributor. (Table 3) Commercially Synthetic Sea Salts (with a focus on those available in North America). Brand names are trademarks of the respective companies. Please note; this may not be an all-inclusive list, as the market continually changes. * = may be out of production. + = Foreign brand that could be imported or relabeled for domestic sale in the US. Given all these extensive marketing efforts, how then, can an aquarist make an informed decision and choose the best brand of synthetic sea salt for their aquarium? Self-evaluation is one possible method to choose the brand of sea salt that is best for your individual application. The following is the result of the evaluation I performed when considering changing brands of sea salt. I don’t name the actual brands, as the testing performed was informal, and was customized to my particular application as a public aquarium curator. 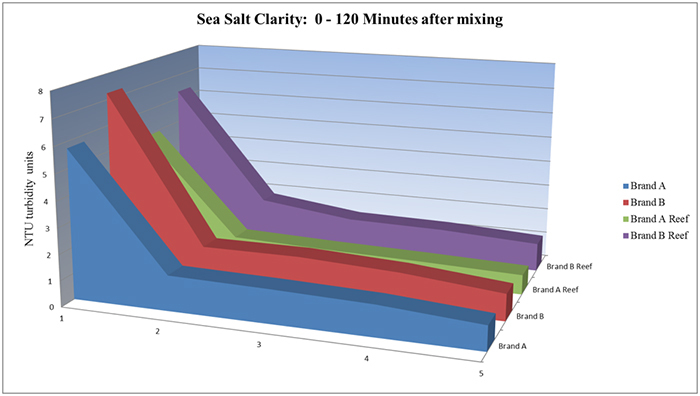 Rather, this information is presented to show possible methodologies that can be used by other aquarists in evaluating their own sea salt usage. I’ve used “Brand A” sea salts almost exclusively for over 45 years. The product worked well and was cost effective. However, as more and more competing products became available, questions arose in my mind whether another brand might be a better value (comparing cost, quality and ease of use). How could I compare the different salts, given the testing methods I had at my disposal? I was not interested in the non-peer reviewed studies available online, because I had no way to judge their accuracy, and some of them were suspected as being “shills” for promoting one product over another. My main concern was that manufacturers do change their sea salt formulations over time. If this change is perceived to be beneficial (i.e. higher calcium levels) the modification might be widely advertised. However, other changes can be made to formulations that are not mentioned by the manufacturer. These can include using less salt by weight in the package. There are also multiple sources of various salts that have different costs (but may also have different levels of contaminants in them). Some of these formulation changes are made for purely cost reasons. How can these be identified and evaluated? Ultimately, the pressure to explore other options became great enough for me to consider switching to a different brand of salt. Because sea salts are such a mixture of chemicals, there are a huge number of “recipes” – some work better than others, but in most cases the differences are rather subtle. Then, the task of comparing dozens of brands of salt against each other makes the whole process more or less impossible within the constraints most people have for time and money. In the end, I decided to compare “my house brand” against one that I felt was the best competing option. Narrowing my options down to these two brands made the process feasible, with the caveat that there still could be a third brand that was a better value. For this project, four products were tested – two from each company. We need both basic sea salt for our primary marine exhibits as well as “reef salts” for our more sensitive live coral exhibits. They are listed here as Brand A, Brand A Reef, Brand B and Brand B Reef. After the study was completed, a third company contacted me and asked that their product also be evaluated. I did this for some of the tests. (Brand C). Visual Test Little can be learned by simply visually inspecting different salt products. The only relative differences that can be seen is uniformity of the mix, and if the product clumps upon exposure to humidity. Mix uniformity is mainly a concern if you buy salt in larger containers, but then only mix up smaller amounts of it at one time. If the mix is not uniform and blended well, it is possible to remove some salt from the package and get slightly skewed ionic composition when you then mix it up. The clumping of the product in response to humidity might not be the issue one thinks it is. Actually, my preference is for a salt brand that absorbs humidity and clumps/cakes. Salts that don’t do this have anti-caking additives, and these may prove detrimental. Anti-caking agents may make the salt more convenient to use, but at what cost in terms of the quality of the resulting seawater? Virtually nothing is known about the possible toxicity of anti-caking agents in synthetic sea salts. The presumption is that if the manufacturer is using food grade component salts, these additives would be safe – but who really knows? 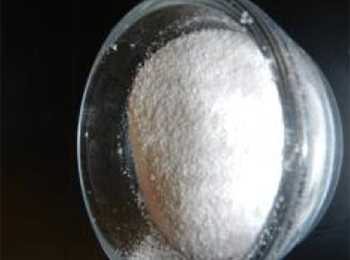 One of the anti-caking materials used is sodium ferrocyanide. The keyword “cyanide” will cause aquarists to take notice. One salt manufacturer has told customers their salt does not contain this compound. That implies that they feel that this compound is detrimental, and that other salt brands that do contain it, are inferior. Of course, that is possibly just a marketing ploy. Sea salt moisture absorption test. A relative comparison for a salt’s ability to absorb moisture from the air can be made by weighing the product, then setting it in a closed water bath for 24 hours and re-weighing. The difference is the amount of moisture that salt absorbed from the air. Some salts produce a brown scum at the waterline after mixing in a container. It is unknown exactly what this material is, but it is presumed to be an insoluble material that results from a contaminant in one of the component salts, most likely the magnesium chloride. This, if true, might mean that such a reaction will only occur with lower quality sea salts. However, is the presence of this residue actually detrimental? If the material is left in the mixing container, then logic would say that it is no longer in the product water once it is transferred from the mixing container to the aquarium. Using pre-warmed water to mix salts, and adding the salt slowly to the water is prudent. Filtering the mixed seawater through a mechanical filter, such as a 10-micron filter sock before use is always the best course of action. It goes without saying that the mixing container should be thoroughly cleaned after each batch. 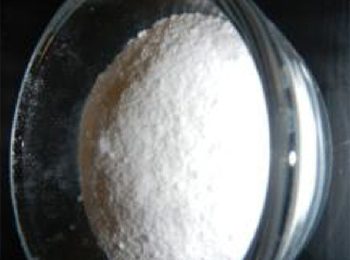 Brand A – fine and coarse powder mix, tends to pack. Brand A Reef – fine and coarse powder mix, dense. Brand B – fine powder, fairly uniform consistency, absorbs moisture from the air. Brand B reef – very fine powder, uniform consistency, absorbs some moisture from the air. 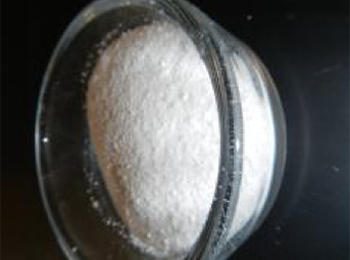 Sodium Thiosulfate Many brands of consumer sea salts contain sodium thiosulfate in order to rapidly remove chlorine present in the domestic water source. This allows the freshly mixed ASW to be used sooner than if the chlorine were to be allowed to dissipate on its own. However, pH stabilization, ammonia removal and solution clarification of the mixed salts also take time, so little is gained by the presence of this de-chlorinator. Indeed, there is some suspicion that sodium thiosulfate is not a benign addition to ASW solutions. It is probable that it will react with iodine (a necessary element in reef aquariums) to form iodide, which is a less useful form. Because ASW is such a mix of ions, it is difficult to predict what other reactions could also occur. Sodium thiosulfate, used in excess, will temporarily reduce the dissolved oxygen level of water. Some brands of sea salt advertise that they either do, or do not contain sodium thiosulfate (depending on their intended market). You could also try contacting the manufacturer and inquire. The presence of sodium thiosulfate can easily be measured using inexpensive DPD chlorine test strips. First, use the DPD test on your source tap water to get a baseline reading. Then, combine 3.5 grams of the sea salt with 100 ml of tap water and allow it to mix for an hour. Test the ASW solution with the DPD test to get a second reading, and subtract it from the first. The difference is the chlorine level of the tap water that was neutralized by the sodium thiosulfate. 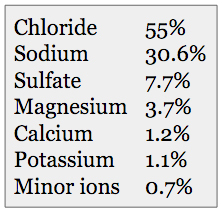 If the numbers are equal, there is no sodium thiosulfate in the mix. If the second number is zero, then sodium thiosulfate is present in the sea salt in excess of what is needed to dechlorinate your particular water source. Ideally, you want to see a 60 to 80% drop in the chlorine level. This means that the water won’t have enough chlorine remaining to be harmful to the fish, yet there also won’t be any excess sodium thiosulfate in the solution that could react in other ways. 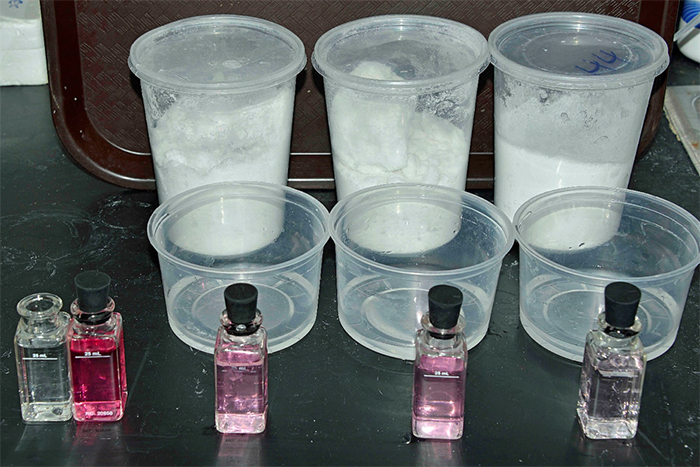 DPD chlorine test on three brands of sea salt – left to right; brands A, B, and C. Lighter pink color indicates less chlorine present after mixing. The dark pink vial on the left is the tap water control. Three brands of consumer sea salt were tested for chlorine after mixing with tap water containing 1.2 ppm total chlorine. Sample A reduced the chlorine by 65%, sample B by 71% and sample C by 90.5%. If you have a need to dechlorinate your feed water, it is advisable to add a standard aquarium dechlorinator to your tap water prior to adding the sodium thiosulfate-free sea salt mix. Reef aquarists will not need to perform that step if they are using carbon filtered reverse osmosis water as the solvent for their salts. Salinity / Yield Test Most aquarists know that the “50 gallon” label on a sea salt product is wholly a function of the resulting salinity in regards to the amount of actual product used to “make” the 50 gallons. In other words, 14 pounds of salt will make 50 gallons of seawater, just at a lower salinity than will a 16-pound box of salt will. In the past, a cost-saving measure used by some salt manufacturers was to reduce the amount of salt in a retail container, while still touting that it makes “X” gallons of seawater. What the aquarist is interested in knowing is the effective yield of one brand of salt compared to another. Can you just look on the boxes and compare the net weights of the product? Unfortunately, it is not as simple as that. Anhydrous salts can be used in salt mixes. These contain less “waters of hydration” which reduces the weight of the product and therefore produce saltier water, pound for pound than would a salt mix containing hydrated salts. Anhydrous salts cost more, but they create saltier water than does an equal weight of more hydrated salts. A simple test is to take the same weight of each salt (in this case 3.5 grams) and add it to the same amount of deionized water (in this case, 100 ml). Each tested salt must be handled in the same manner. Dry salt mixes will also gain and lose moisture based on the humidity of the air they are stored in. As long as all samples are treated the same way; opened at the same time, held in the same room, etc. the amount of moisture absorbed from the air won’t matter when comparing one salt to another. I ran this test four times for each sample and took the average. The testing showed that brand B will make 11% more seawater per pound, than will brand A. This could equate to a $6000 savings per year based on our estimated usage. Brand C had the lowest yield. Price The cost per pound of the sea salt is obviously an easily determined value. As mentioned, beware of comparing the cost of sea salts based on their advertised “yield” as this will vary depending on the ending salinity of the mixed product. When comparing costs, you take the net weight of the package (including any shipping charges), and divide that by its net cost to result in a cost-per-pound. Using the yield test, you can then determine the cost per gallon. The range in this cost is substantial. Large public aquariums making their own synthetic seawater, may see costs as low at nine cents per gallon at a salinity of 28 ppt. Conversely, there is an enriched natural seawater product on the market that costs over $5.50 per gallon. For home aquarists, finding deals that offer free shipping (or buying from a local store) will usually result in the best price for a heavy product like sea salt. Buying salt in bulk will also help lower your overall cost. However, be aware that mixing up small volumes of seawater from a large amount of bulk salt can result in skewed ionic composition in the resulting solution. This can occur because some of the salt crystals in the salt mix are different in weight and size. 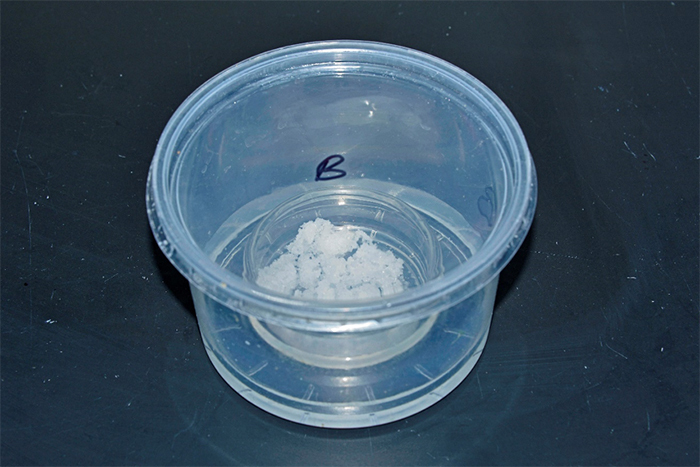 This means that some settling of contents will occur, and taking a small amount of that salt from the container may result in higher or lower amounts of some components to be dissolved. The best results will be obtained by mixing the entire contents of a salt package at one time. If you cannot do that, the next best result can be obtained by hand-mixing the salt mix thoroughly before removing a smaller amount to use to make up the seawater. In our situation, 2000 pound “supersacks” of Brand A cost $856.11 each, delivered by the truckload. Brand B costs $834.46 per super sack, with the same delivered price. Switching to brand B would equate to a modest savings for us of $1100 per year. Supersacks of Brand C cost same cost as brand B, but because of its lower yield, Brand C would end up costing 11.5% more per gallon of water at the same salinity. Ammonia Test I’ve known since the early 1990’s that some brands of sea salt contain trace amounts of ammonia in the mix as a contaminant in one of the component salts. This is usually transient issue, because typically, an aquarium system’s bio-filter will convert that ammonia to nitrite and then nitrate over a day or so. Still, the additional nitrate that results reduces the benefit of changing water with that product by a small degree. Results of the ammonia tests. Dissolution Rate How fast a salt dissolves in water and then clarifies has a bearing on how soon it can be used after mixing. The four original salts were mixed in 100ml batches and then tested five times over two hours for clarity using a Hach turbidimeter. 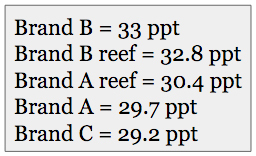 Brand A and its sister Brand A Reef were marginally faster at dissolving (see chart below). However, after 48 hours, the samples were very close in range, and Brand B was actually clearer than Brand A. Amount of salt remaining undissolved after 40 seconds of mixing. Left to right; Brand A, Brand B, Brand A Reef and Brand B Reef. The whiter the patch at the center of the cup shows more undissolved salts remaining. 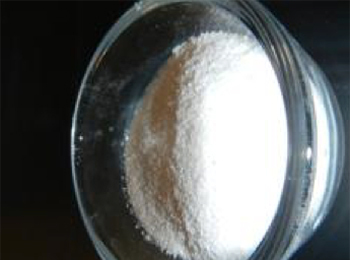 Even without a turbidimeter, the relative dissolution rate can be compared by mixing the samples equally, and qualitatively judging the amount of undissolved salts in the sample. It does seem that anhydrous salt mixes dissolve slower and require more mixing in order to clarify. Aquarists then need to determine if they need a fast clearing salt mix, or one that has other benefits, but mixes up more slowly. Sea salt clarity: 0-120 minutes after mixing. pH After Mixing The pH of synthetic seawater after mixing is an important consideration. If it is too high (>8.8) it could be harmful to the animals in the aquarium when used during a major water change. If it is too low (< 8.3) it will not boost a system’s pH as much as needed when used to perform water changes on older systems. pH readings of the four salts one hour after mixing. The initial pH of the ASW is less of an issue than is the pH at the time it is used. In some cases, simple aeration of the ASW will see a change in the pH of the solution as it reaches equilibrium with the carbon dioxide in the air. As previously mentioned, if there are other reasons that you filter or aerate your ASW prior to use, you need to measure the pH just prior to use in order to get a true reflection of that value in real world applications. Reef Salt Testing Reef aquarium animals have some specific requirements for their water that must be met by using synthetic sea salts that have a different formulation from general purpose synthetic sea salts. Using standard hobbyist test kits, we evaluated the two brand’s reef salts. The results of the alkalinity, calcium, and magnesium testing. The Mystery Substance Four sea salt samples were run through a full wavelength scans on a Hach DR5000 spectrophotometer, using sample B Reef as the zero blank. 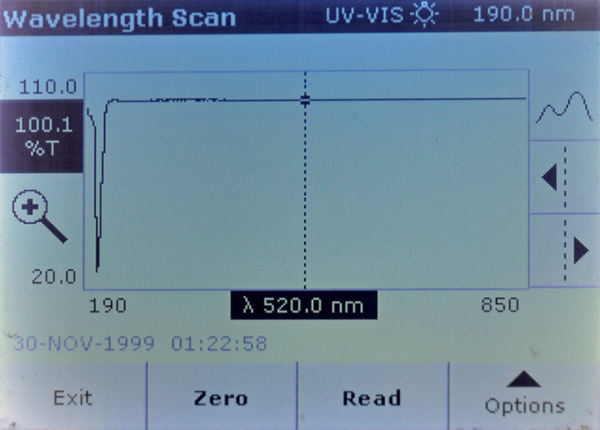 After the spectrophotometer was zeroed using that blank, any increased light absorption at a particular wavelength would indicate the presence of some compound(s) that are opaque to that particular wavelength above the concentration found in sample B Reef. Likewise, if the other three samples showed a greater than 100% transmittance at a given wavelength, which would mean that sample B Reef was lower in concentration for some compound. Note that there are many dissolved ions that do not absorb any wavelengths of light, and just knowing that there is absorption at a specific wavelength does not tell what that compound is. The scans show that both Brand A and Brand A reef had a strongly UV opaque compound in them that Brand B and Brand B reef did not have. This material blocks all but 20% of the light at 208 nm. In speaking with other public aquarists, two possibilities came forward: that anti-caking compounds in Brand A could be the culprit (Possibly EDTA). 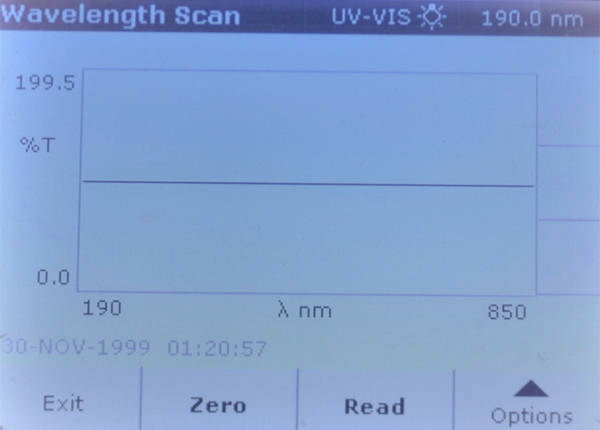 Other aquarist thought that the reduced transmission at 208 nm could be due to an excess of sodium thiosulfate in Brand A. I tested a solution of that dechlorinator and it had strong absorption at 214 nm, not 208. In any event – the fact that the Brand B products clumped up after opening indicates that they do not contain anti-caking compounds. This is a preferable condition, as the closer a product is to natural seawater, presumably, the better it is for the animals. Brand A Reef – Stronger absorption at 208 nm. Brand B – Some absorption differences in the UV spectrum – but less than 5% difference. Brand A – Very strong absorption peak at 208 nm. Outside Testing We were faced with choosing between two brands of salt with a potential yearly expenditure $75,000. For a decision of this magnitude, we wanted to ensure that our evaluation was as complete as possible, so we sent samples of the water out to a laboratory for further testing that we could not easily perform in-house. The results of the outside laboratory testing. These numbers are not presented for comparison by you, the reader, but rather, to illustrate how challenging it can be to evaluate sea salts. In this case, the samples were made up by dissolving 3.5 g of the respective sea salt in 100 ml of de-ionized water, and then shipped to a lab for analysis. As previously mentioned, Sample A salts have more waters of hydration in the product, so the resulting seawater will be lower in slat content when compared to seawater prepared with the same weight of salts, but of less hydrated compounds. In order to make a proper direct comparison, the samples should have been normalized to exactly the same salinity. Still, some conclusions can be drawn from these results. Readings the chart from left to right, the lower salinity of Sample A was confirmed. All products resulted in appropriate final pH levels. 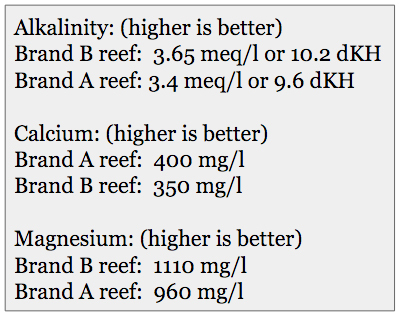 Sample A reef had the highest alkalinity, even given its lower salinity. All of the salts measured higher than NSW in lithium, and lower than NSW in molybdenum. The Solvent Used Certainly the solvent used to mix up synthetic seawater has an effect on the quality of the resulting solution. For the testing I performed, laboratory produced de-ionized water was used as that is what I had available. Home aquarists generally use tap water or reverse osmosis prepared tap water. Nano-aquarists may use steam distilled water from the grocery store, since the volume they need is so small. As mentioned, some sea salt manufacturers add sodium thiosulfate to their mix in order to remove chlorine. Be aware that some municipalities add chlorine and ammonia in their water treatment process. This is done to reduce the formation of trihalomethanes, which are known to cause human health issues. The ammonia binds with the chlorine to form chloramines – so that the methane present in the water cannot bind with the chlorine. Chloramines need to be dealt with by first breaking the chlorine / ammonia bond with a double dose of a good dechlorinator. Then, the free ammonia needs to be removed; either by binding it with an ammonia-neutralizing compound, or through biological filtration. Reverse osmosis/deionizing systems may remove chloramines if they have a good quality carbon pre-filter. Some municipal water systems also add phosphate in order to provide some detoxifying effects against the presence of heavy metals. Alum is sometimes added as a clarifying agent for tap water. This compound, (Aluminum sulfate) can clog reverse osmosis membranes, but running the water through a standard water softener before the R/O unit seems to help in that regard. Conclusion I worked on this article for the better part of a year, putting it away at times, then returning to it. I was concerned that the information it contained would create legal issues with the marketing departments of the brands of salt that I evaluated, so I masked the product names and then decided to publish this article using a pseudonym. Although I used the results presented here to ultimately change the brand of salt we used, this article itself is NOT a product test. Instead, it was written to illustrate for aquarists, certain tests that they can perform in order to evaluate various brands of sea salt. Don’t let others choose what brand of sea salt you use for your aquariums when you can make your own, better informed decision!